NEW! Odyssey 2.0 released with netiod and anetd support. 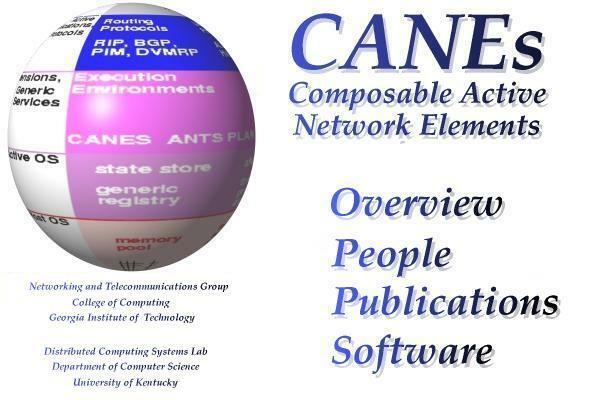 The Composable Active Network Elements (CANEs) project is a DARPA/ITO-funded effort investigating architectures and applications for active networking. The CANEs project seeks an approach to active networks that supports high performance while also permitting dynamic modification of network behavior to support specific applications and/or provide new services. The project comprises an overall architecture for the active network; a specific user-network interface (the CANEs environment); and experimental studies of the effectiveness of various active networks in support of specific applications and services. This material is based in part upon work supported by the National Science Foundation under Grant No. MIP-9502669. Any opinions, findings, and conclusions or recommendations expressed in this material are those of the author(s) and do not necessarily reflect the views of the National Science Foundation.